At the invitation of the Chinese government, H.R.H Princess Bajrakitiyabha Mahidol of the Kingdom of Thailand will visit China from September 7 to 9. As close friendly neighbors, China and Thailand have maintained the sound and steady development of the bilateral relations for a long time. China values the traditional friendship with the royal family of Thailand and appreciates its positive contributions to the development of China-Thailand friendship. During the visit, the Chinese leaders will meet with Princess Bajrakitiyabha Mahidol and they will exchange views on the China-Thailand relations and issues of mutual concern. We are convinced that princess Bajrakitiyabha Mahidol's visit is conducive to promoting the friendship and the greater development of the relations between China and Thailand. At the invitation of Foreign Minister Wang Yi, Nepalese Deputy Prime Minister and Foreign Minister Krishna Bahadur Mahara will pay an official visit to China from September 6 to 11. China and Nepal are traditional friendly neighbors, and the relations between the two countries have maintained the sound momentum of development. Deputy Prime Minister and Foreign Minister Krishna Bahadur Mahara's visit is another important interaction between China and Nepal this year, which will further advance the implementation of the consensus on cooperation reached between the leaders and the government of the two countries and deepen the practical cooperation under the framework of the Belt and Road Initiative. During the visit, Deputy Prime Minister and Foreign Minister Krishna Bahadur Mahara will hold talks with Foreign Minister Wang Yi and meet with Chinese leaders. Q: Yesterday, in his keynote speech at the opening ceremony of the BRICS Business Forum, President Xi Jinping emphasized that it is important to promote an open world economy and the trade and investment liberalization and facilitation. Does this mean that BRICS countries will take new measures to promote global economic development? A: BRICS countries, as the representative emerging markets and developing countries, owe their rapid development and rise to the environment of an open world economy. They have proposed to build an open world economy and discard all forms of protectionism on multiple occasions. In order to uphold the sustained growth of their own economies, BRICS countries will certainly continue advancing the building of an open world economy. The economic and trade cooperation has always been the stabilizer and propeller for BRICS cooperation. For many years, BRICS countries have done a lot in advancing trade and investment liberalization and facilitation. The BRICS Summit in Xiamen have examined and approved a series of important documents such as the Outlines for BRICS Investment Facilitation, the BRICS Trade in Services Cooperation Roadmap and the Framework on Strengthening the Economic and Technological Cooperation for BRICS Countries. These tangible outcomes and measures will not only help to move forward the economic cooperation and trade among the five countries but also play a positive role in promoting the economic cooperation and trade between BRICS countries and other countries. As the representatives of emerging markets and developing countries, the BRICS countries, by promoting the building of an open world economy and advancing trade and investment liberalization and facilitation, serve not only their own interests but also the interests of the developing countries as a whole and will help inject "BRICS vitality" and make "BRICS contributions" to the pursuit of the robust, sustainable, balanced and inclusive growth of the world economy. Q: Some people say that the different views on certain issues among BRICS countries have somewhat held back the long-term development of BRICS cooperation. How do you respond to that? A: It is only natural that countries may have different views or even divergences regarding certain issues. Despite different national conditions and respective strengths, BRICS countries are in the similar developmental stage and share the same development goals, and their common interests far outweigh differences. All this serves as the fundamental driving force and basis for the robust and sustained development of BRICS cooperation. In the past decade, with the concerted efforts of BRICS countries, BRICS cooperation have attained outcomes that attract worldwide attention. We have made major contributions to coping with the global financial crisis in 2008, moved forward mutually beneficial cooperation, established the New Development Bank and the Contingent Reserve Arrangement, and upheld multilateralism and staked out our position on major international and regional issues. BRICS countries have upheld the BRICS spirit in our cooperation all along. Decisions are made through consultation among us all, not by one country alone. Practice has proven that BRICS countries can surely rise above differences and BRICS cooperation is full of strong vitality. We believe that as long as we uphold strong faith in cooperation, enhance mutual trust and accommodate each other's concerns, we will surely achieve steady and long-term progress in BRICS cooperation. Q: The DPRK conducted its 6th nuclear test yesterday. Will China now support even tougher UN sanctions on the DPRK? Will China support a limitation on oil export to the DRPK? A: Yesterday, the DPRK carried out the 6th nuclear test. The Chinese Foreign Ministry has immediately issued a statement to state our solemn position. As to how the UN Security Council will respond and what action it may take, this depends on what comes out of the discussion by its members. China has always stayed committed to the denuclearization of the Korean Peninsula, upholding peace and stability on the Korean Peninsula and promoting the peaceful settlement of the relevant issue through dialogue and negotiation. As a permanent member of the Security Council, China will follow this position and participate in the relevant discussion with an responsible and constructive attitude. Q: First, was China informed beforehand of this nuclear test? Second, what China has done to prevent the nuclear test by the DPRK? Third, Has the Foreign Ministry summoned the DPRK's Ambassador to China to protest against this nuclear test? Fourth, what measures will China take given that the DPRK has carried out a nuclear test? A: Regarding your first question, China stays committed to the denuclearization of the Korean Peninsula and opposition to the DPRK's nuclear and missile development. This position is known to all, and the DPRK has been very clear about this. As to the second question, for a long time, we have made enormous efforts and done a lot to promote the peaceful settlement of the Korean Peninsula issue through dialogue and negotiation. We have put forward the "dual-track" approach and the "suspension-for-suspension" proposal, maintained communication with various parties on this, helped them to work for the shared goal and tried to cool down the situation as soon as possible. On the third question, the Chinese government has immediately expressed its solemn position through the Foreign Ministry's statement. 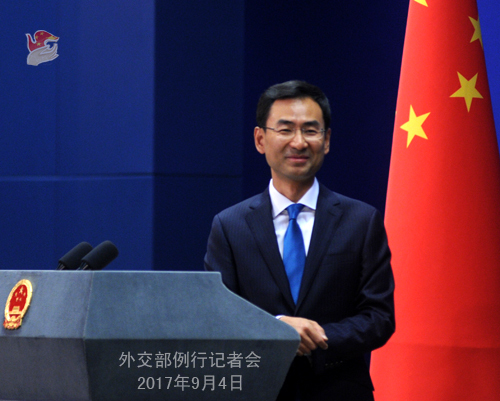 The Chinese Foreign Ministry has lodged stern representations with the principal of the DPRK's Embassy in China. As for the fourth question, China has always comprehensively and strictly implemented the relevant UN Security Council's DPRK-related resolutions. We are fulfilling our due international obligations, at the same time, we will continue to approach the relevant issue with the principle of helping realize the denuclearization of the Korean Peninsula and uphold peace and stability there. Q: The DPRK nuclear test coincided with the BRICS Summit. Has China complained to the DPRK about the timing of this test? A: The DPRK's nuclear test at any time is wrong, as it violates the Security Council resolutions and is against the will of the international community. China is firmly opposed to this. Just as I said, the Chinese Foreign Ministry has lodged stern representations with the principal of the DPRK's Embassy in China. Q: Has China ever expressed concerns to the DPRK or other countries over radioactive contamination from the DPRK's nuclear test spilling potentially into China? A: As for the possible impact of this nuclear test on the environment, the Chinese Ministry of Environmental Protection has released the relevant information on the situation. The Chinese government attaches great importance to protecting the Chinese nationals' personal safety and environmental safety. The Chinese competent authority will continue to gather the comprehensive information on the impacts of this nuclear test on China and take necessary measures to safeguard the Chinese nationals' personal safety and environmental safety in its territory. Q: According to reports recently, the US required the Russian government to close its Consulate General in San Francisco and other two diplomatic posts in the US before September 2, and seized two of them on that day. The Russian side expressed strong dissatisfaction with this and demanded the return of the diplomatic facilities immediately, otherwise the US will bear the total blame for the ongoing degradation of the relations between the two countries. What's China's comment on that? A: According to the Vienna Convention on Diplomatic Relations, the Vienna Convention on Consular Relations and other international law and practice, countries should assist the diplomatic and consular missions and personnel posted there in performing their normal duties. Both the US and Russia are major countries with important influence which undertake crucial responsibility in upholding world peace, stability and security. We hope that Russia and the US can properly resolve the relevant issue through dialogue on an equal footing on the basis of following the basic principles of international law and in the spirit of mutual respect. Q: According to reports, the Cambodian government arrested Kem Sokha, President of the opposition Cambodia National Rescue Party, in the early morning of September 3, claiming he has been in collusion with foreign forces and suspicious of conspiracy and undermining state security. How do you comment on that? A: We have noted the relevant information. As a good neighbor, friend, partner and brother of Cambodia, the Chinese side has always supported Cambodia in following the development path suited to its national conditions and the Cambodian government's effort to uphold national security and stability. Q: Two weeks after the settlement of the stand-off in the border area, India has appointed a woman as a defense minister. This is rare anywhere in the world. How does China respond to that? A: The personnel change in the cabinet of the Indian government falls within the internal affairs of India. As a principle, we will not comment on other countries' internal affairs. Q: According to reports, the Jiangsu-based Yabaite Technology Co. Ltd, falsely claimed that it is involved in the metro bus project in the city of Multan and lied about its performance by forging the letters from Punjab Chief Minister Shehbaz Sharif and other politicians. The relevant Pakistani politicians have denied the letters and said they were forgeries. According to our information, the relevant Chinese authorities are investigating and handing this case. Can you confirm that and give more details? A: On May 12, China Securities Regulatory Commission (CSRC) issued a public notice that the Jiangsu Yabaite Technology Co. Ltd inflated its operating incomes and profits by fabricating overseas engineering projects from September 2015 to 2016. The CSRC, along with the relevant Pakistani authorities, has probed into the company involved. It did not admit the letters from the prominent Pakistani political figures submitted by this company as evidence and found no evidence of any economic relations or capital flow between this company and other Pakistani company or individual. The CSRC will hand out an official punishment to the company involved and publicize the result of the punishment in accordance with law in days. You may ask the CSRC for more details. I would like to stress that the Chinese side has always requested the overseas Chinese enterprises to operate in a law-abiding manner and investigate and punish the activities violating law and regulations in accordance with law. China stands ready to work with Pakistan to promote the sound development of China-Pakistan economic cooperation. Q: Regarding the illegal trespassing over the boundary of the Indian border troops and their stay in the Dong Lang area, will the Chinese side raise that issue with the Indian side during the BRICS Summit? A: As my colleagues have said, during the Xiamen Summit, our leaders will meet with the participating leaders of relevant countries as we are the host. The details of their meetings will be released in due course. 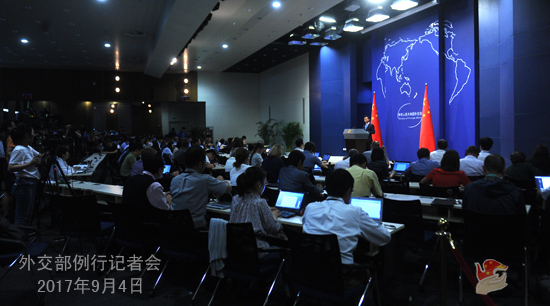 Q: When the DPRK carried out its 5th nuclear test last year on September 9, the Foreign Ministry of China issued a statement stressing the role of the Six-Party Talks in resolving the relevant issue. But these wordings are not in the statement put up by the Foreign Ministry yesterday. Does that signal a change to China's position on resuming the Six-Party Talks? A: I can tell that you did read the statements very carefully. I want to assure you that there is no change to China's position and attitude with regard to the Six-Party Talks. In fact, an early resumption of the Six-Party Talks is more than merely China's wish. It also features in the relevant resolutions of the UN Security Council and represents the common aspiration of the international community. We hope that all relevant parties could make joint efforts to that end. Q: The US once again threated to potentially use military intervention in the DPRK to resolve the nuclear issue. If the US were to do that, would China also get involved militarily? A: You posed a hypothetical question, and I am not going to answer that. 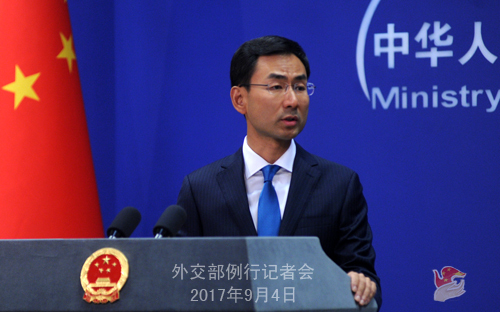 China has reiterated many times that military force cannot be an option for the settlement of the Korean Peninsula nuclear issue. You may also have noticed that after the DPRK's 6th nuclear test and amid the strong responses from the international community, many countries have stressed in their statements and remarks that peaceful solution will be the only correct way out of the Korean Peninsula nuclear issue. China also sides with them on that.